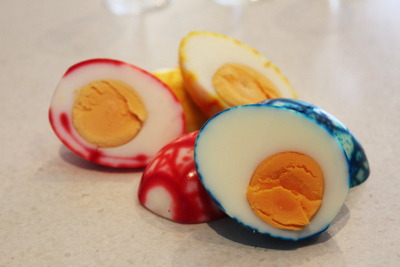 At Easter there are a range of different ways to decorate eggs, but here's a way you can decorate and eat them too. It might look tricky, but these eggs are actually pretty easy, as long as there's an adult to help out with the cooking. The technique comes from a traditional Chinese snack, the tea egg. 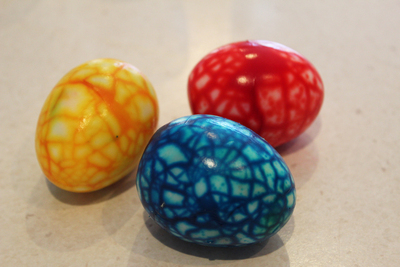 Instead of flavouring the eggs, these are just coloured, giving them a very striking look. First you'll need to boil the egg. Place it in a saucepan and bring to the boil for 7 minutes. 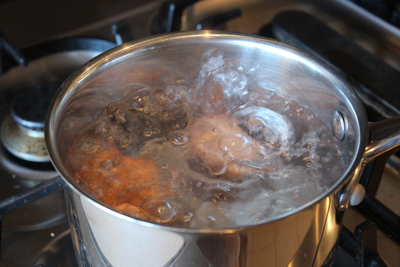 Then turn the heat off, but leave the egg to sit in the hot water for a further 5 minutes. Remove your eggs from the water, and let them cool. I like to first pop them straight into a bowl of cold water so that they cool down quicker. The next step is to start cracking your egg shells. 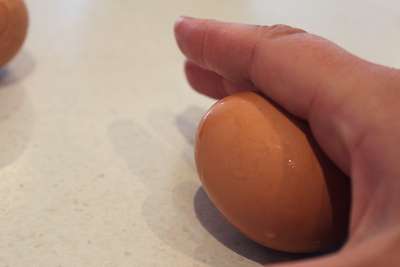 Younger kids may need a bit of help with this, as they might not know how much pressure to put on the egg. I like to make a small crack with a spoon first, as it releases some of the tension of the eggshell. 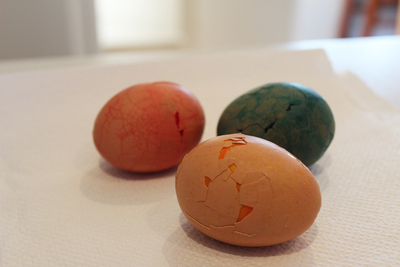 Then use the ball of your hand to roll the egg along a hard surface, creating small cracks all over the shell. If you try this without cracking with a spoon first, the pressure can actually sometimes split the egg. 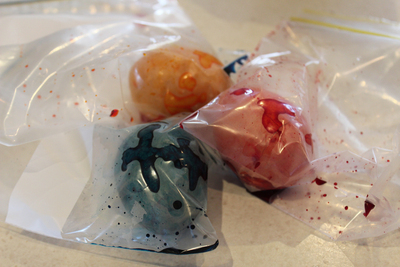 Place the eggs in individual zip lock bags, and add a few drops of food colouring. 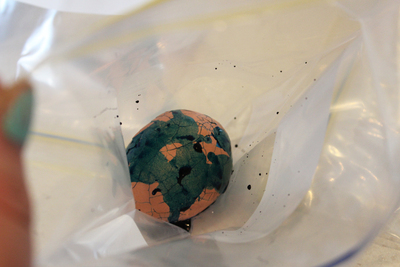 Roll the egg around in the bag so that it's coated with food colouring. 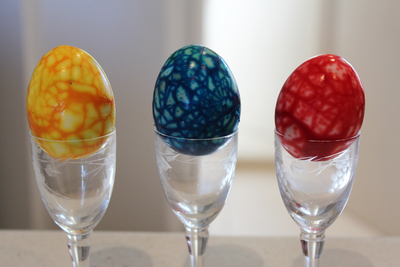 Rinse the eggs with water to get off any excess colour. It's best to wear gloves if you're handling the eggs. Before they're washed there will be a lot of colouring and you'll have multi-coloured fingers in no time. 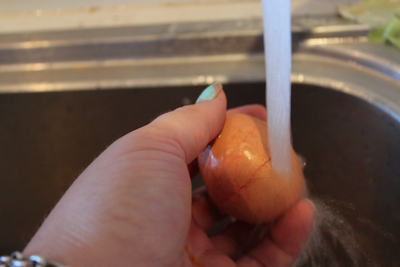 Pat the eggs with paper towel to remove the water. For the real effect you need to start peeling away the eggshell. Once the eggs are ready you can eat them whole, or add them to any egg dish. A well deserved win. I have never tried this technique before but the result is amazing and a bonus that they are safe to eat too. 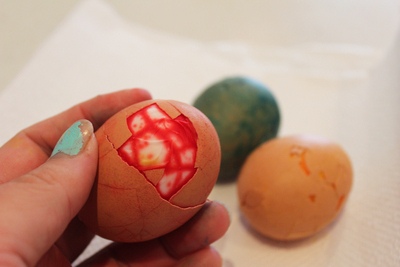 Congratulations - the marbled eggs have won our Easter Egg decorating competition. My niece reckons these would make awesome dragon eggs. Maybe a good idea for decorations if you've got a dragon or magic party!